The iWork suite was previously an exclusively Mac software package. But Apple aiming on increasing functionality of its other handheld products launched the well known software bundle for the multi-touch interface and making it accessible for mobile iDevices. This packager is more on the corporate side of the gadgets’ concept with run of the mill features not unlike Microsoft Office suite. Below is an insight into this new opportunity thrown open by Apple for iDevices so that people can have more seed in the sack wherever they go. The bundle consists of three applications allowing the iDevice user to manage and create presentations, spread sheets and documents on the go. Keynote: This software allows users to produce multimedia slides and animated presentations with a host of effects, animations, transitions, charts and other options. Presentations and slideshows can be played on the current iOS device as well as the big screen such as a projector or HDTV. There is also a Keynote Remote app available for download at $0.99 which can transform the iPhone into a remote control for the larger screen. Pages: The Document management app allows normal and efficient management of the user’s complex text files with business features. Some options are like the Smart Zoom option automatically activated when editing is taking place and zooms out upon the editing is finished. 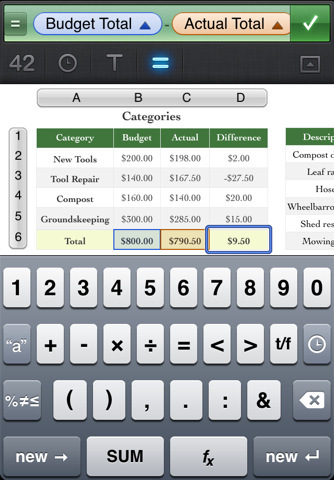 Numbers: To complete the set, Numbers app provides the excel work sheet, data sheet and spread sheet coverage in the package. Complete with multi-touch gestures, virtual keyboard, SmartZoom and more than 250 other functions it brings the entire Mac experience to the iPhone. iWork for iPhone, iPod Touch and iPad will be compatible with the Mac version of iWork and will support Microsoft Office documents as well. All iWork files, moreover, can be moved, customized, shared and utilized in multiple ways. The iWork collection can only be employed on all iPads with iOS 4.2.3 or higher, iPhone 3GS & 4th gen and the iPod touch in 3rd and 4th generation only. The introduction of this package will not transform the purpose of handset iDevices into a major corporate navigating and management platform but will suffice to make slight edits, checks, data carrying or data, readability and other uses. This move is among a number of advancements by Apple as it comes into “season” with competitions against other major rivals. What with the iPhone 5, iOS 5 and iPad 3 and now the iWork suite.